I had family from Interstate, and did not have much in the house, so we decided to make our own pizzas. 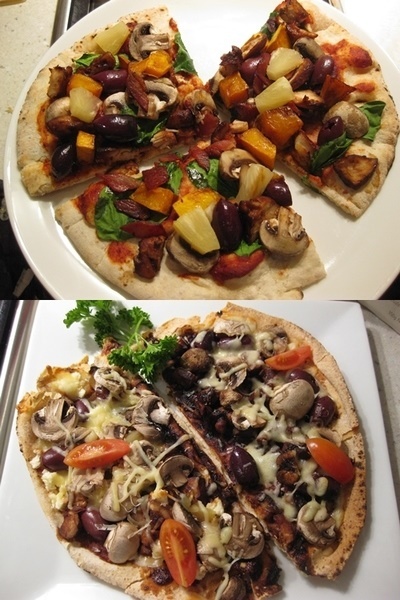 These are far healthier than bought ones, and two of the people also had to eat dairy free, so I knew exactly what was in the pizzas. Pizzas are not really difficult to make, nor do they take a long time to make. I usually make double the dough and freeze it so that I can just take it out of the freezer and make a pizza whenever I feel like it, or whenever I have leftovers! However, in this instance, I had no dough and was in a hurry so used a bought base, which is not as nice as my own! This is a family meal, and a good way to get children to eat vegetables, as they are hidden! If need be, cut them up very small so they do not actually see them. This is healthy, as it has tuna in it which is rich in Omega 3's. The taste of this meal is extra delicious, and quite easy to make with only 30 minutes of cooking time. It can also be heated up easily in the microwave if you are making it for less people than five - I generally only cook for about 2 people but had visitors when I made this meal. I generally use John West large tins of tuna in spring-water, however tuna in brine will also be OK - I do not use much salt in cooking due to high cholesterol problem! These are healthy spring rolls which are not fried, and therefore have no oil. Rice paper rolls are easy to work with, and are an Asian speciality and available in the Asian isle of most supermarkets. The prawns have been roasted in the oven, and the quinoa boiled, plus the recipe has raw vegetables in it. It therefore has many healthy elements to it and saves you making a salad. They are great either hot or cold, on a buffet table, and I also made a dipping sauce with them. They are also good for lunch boxes, and are very versatile, and most importantly, my lovelies, they are very delicious! I am often tempted to buy these, however even though they are a bit fiddly, they are quite easy to make, and you can virtually put in whatever filling you want. If you don't eat prawns, substitute - anything goes with this recipe. I also love cooking with Hoisin sauce as love both the smell and the taste of this Asian sauce. This chicken roulade (or roll) has a wonderful mixture of smooth cream cheese with bacon and almonds, and a hint of olives. They are a bit fiddly to make, but well worth the effort. The taste is very delicate and the flavours are brilliant mixed together. You need to flatten out the chicken as it is nicer if it is thinner, however this is optional. I always cut off the bits of fat if there is any on chicken breasts, and I generally use Mt Barker (A West Australian chicken company) as I find their free range chickens are nicer than the cheaper ones. I always emphasize, however, that you never over cook chicken breasts or they become dry - if you just cook them till the pink is gone, they will be tender and delicious. This recipe is suitable at a buffet, as you can slice the chicken into thin slices and serve with any other finger foods. I made this loaf of bread in my bread-maker, and adapted it with things that I like in bread! You could add whatever you wanted, or just have it plain. It is a 1 kg size, and I generally slice it and then put the slices individually in the freezer. This way there is no wastage, and I just take out one piece at a time, and it is always fresh. I used Laucke bread mix as they have the European style bread, and I can add other things to many of their mixes, and get an excellent result. Follow your bread-maker instructions to make rye bread. Add the nuts and seeds as per instructions - I put small seeds in with the mixture and larger ones. I also put walnuts in the special holder that my bread-maker has for larger items. This is a rich dessert which I made into 3 portions, however the mixture is easily enough for four servings. As I was on my own for this meal, I would have had to throw out if I made four, and did not want to waste the lemon butter! You can use a shop bought lime butter (or curd) and it will look more like a trifle then, as the bought one has yellow colour in it, and the layers will be more distinct and look more like a trifle! The home made one is really easy and quite quick, so if I have time, I would always make my own. As you do not use a lot in this recipe, you would also have some left over for other uses! Whip the cream and icing sugar until soft peaks form, and divide them into two bowls.